I erupt into cheers. I’m sat in a sports pub in Kilkenny watching a World Cup qualifying match on TV as home team Ireland take on Sweden. Irish forward, Robbie Keane, valiantly scrapping away in front of goal, has snuck one past the keeper and put the home side one-nil up. Now, I’m English but being a Spurs fan this reaction is ingrained in my every fibre despite our erstwhile striker having left my club a good few years ago. Keane’s tenure at White Hart Lane has conditioned me with a sort of Pavlovian loyalty. Robbie is a footballing commodity though and club loyalty is a luxury frequently-transferred players can't afford to have. I thought at least I'd be in good company, but I immediately feel a bit daft because my congratulatory shouts are the sole response to the goal; nobody else in the room is cheering. Nobody else is really even looking at the screen… they're more interested in the All-Ireland hurling trophy, the Liam McCarthy Cup, I've nonchalantly perched on a table next to my pint of cider. The sport of hurling is huge in Kilkenny, bigger than any other Gaelic sport and bigger even than football, so when I stroll through the city’s streets clutching a trophy as symbolic to the locals as the FA Cup and the Premier League trophy melted down and recast as a statue of Sir Bobby Charlton snogging Barbara Windsor would be for the English, it’s unsurprising that we stop traffic. “It’s a replica,” I tell the occupants of a car that screeches to a halt beside me and the wide-eyed maniacal glint in their eyes subsides, they smile and drive on. This is a lie. It is the real cup. Well, one of them at least. 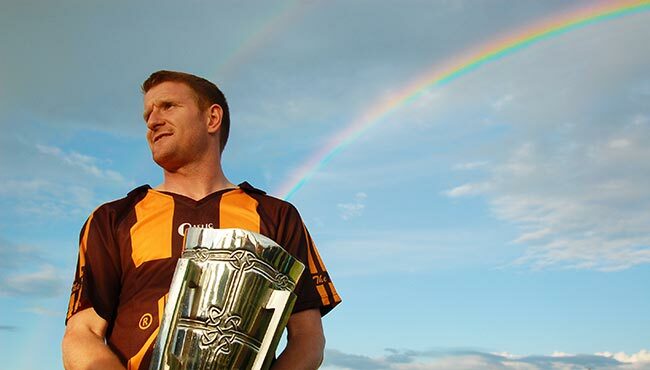 There are three MacCarthy Perpetual Challenge Cups (to give it its full title) in existence, you see. The 1921 original which was retired in 1992 and now is on permanent display in Dublin’s Croke Park stadium; its replacement exact replica which is what you’ll see awarded to the winners at the All-Ireland Senior Hurling Final; and a third identical trophy which the winning team takes back to their home county and I’m now carrying under my arm as I weave in and out of the revellers on a Friday night on Kilkenny high street. 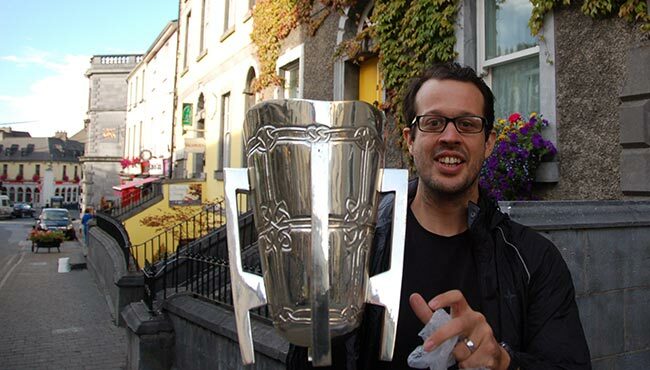 If they’d known my companion and I were also carrying 10 tickets to the 2013 All-Ireland Senior Hurling Finals, with a combined street value of up to €10,000, we might have had to sacrifice this trophy as a getaway decoy. I’m not just in Ireland this weekend to visit Kilkenny Castle, drink in the local pubs that spew live music and Irish stepdancers, and watch the hurling final though: I’m here to try my hand at the national pastimes, Gaelic sports that attract viewers in their millions locally but are relatively unheard of outside of this small island. Jaded by the big business decisions that come foremost in the once beautiful game, I’m intrigued by the notion of national sports played by amateurs. From Dublin it’s just an hour-and-a-half train ride down to Kilkenny, the county that has won the All-Ireland Senior Hurling Finals more than any other team, 34 times. It’s here I meet up with star of the sport Richie Power, a nationally revered sporting hero at weekends and a travelling salesman by day. He must have something of a Clark Kent complex. Despite playing for the most successful club in the top flight of the most widely played sport in Ireland he's not a professional, he’s not even paid. 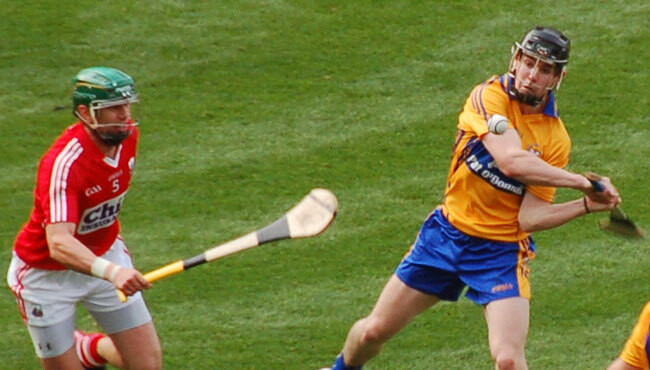 For the uninitiated, hurling is 3,000 year old sport a bit like a hybrid between field hockey, rugby and quidditch. Legend has it that it all began when a man killed a dog with a stick and a ball. Nowadays only humans are on the receiving end of the odd blow to the head: two teams of 15 players, each armed with a large wooden stick with a flat paddle at the end called a hurley, take to a huge field and attempt to score points by using their hurley sticks to wallop a small leather ball, a little reminiscent of a baseball, called a sliotar either between the vertical arms of an opponent’s rugby style H-posts (for one point) or in the netted goal below the horizontal post, defended by a keeper (for three points). 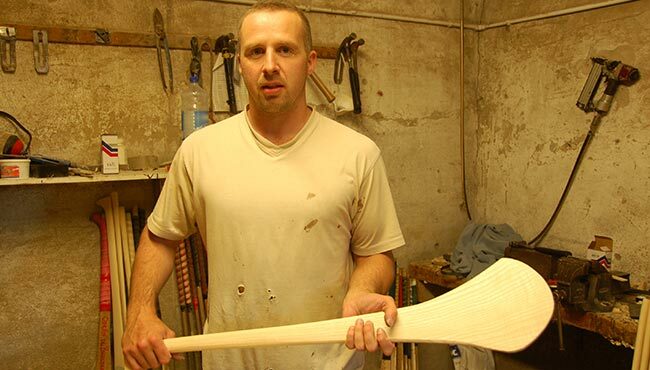 Adding to the magical, hand-wrought atmosphere of the sport, many of Kilkenny’s star players have their hurleys hand-made by local hurley-maker Mark Dowling who, like his father before him, creates three for each player, all hewn from the same piece of Irish ash, though they say locally that you do not pick your hurley, the hurly picks you, so he also spends a fair bit of time repairing players' damaged favourite sticks. Once my hurley has picked me, I take to the field and chat to Richie as he puts me through my paces and teaches me the basics of his beloved sport. We talk about Gareth Bale’s €100m transfer deal and his astronomical weekly earnings and I ask Power, as a man at the top of his own game, if he’s not just a little bit envious of how good soccer (as they call it here) stars have it. Wouldn’t he like to be similarly remunerated for his skills? His response is refreshing: "When you introduce money into the sport it becomes a business, he says, “Winning the All-Ireland trophy, getting your medal, that's what you play for, it's what you dream of when you’re a child. You're only playing for the pride of victory"
Power says he does not want to be paid a wage on par with Premier League players and would go so far as to oppose it if it were mooted. He believes that victories are sweeter when they are the only goal because defeat is that much more bitter when you don't have an astronomical salary for comfort, regardless of the result. It’s this attitude that makes the sports of the Gaelic Atheltic Association special. The GAA is the governing body for Gaelic football, handball and hurling. Its remit is not just to promote the sports but to champion Irish culture, music and identity. Hurling and Gaelic football are the fabric upon which this rich tapestry is woven and, with 2,400 clubs dedicated to Gaelic sports around the country, its embroidered onto the hearts of most every man, woman and child. It’s not about money, it’s about history, community, pride and competition. It’s about what all sports once were and ought to be about. While Kilkenny’s residents might disagree as they play it almost exclusively, hurling is not the only traditional Gaelic sport in Ireland. 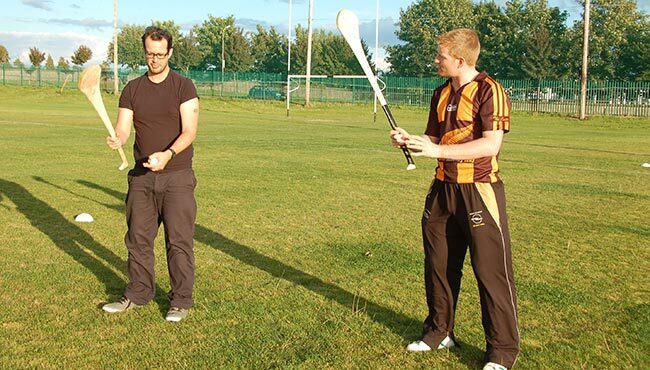 In order to make dual use of the country’s playing fields Gaelic football is also played on the same pitch as hurling and the rules are near-identical with the notable exception that players are not armed with dirty great sticks. On my way back up to the capital and Croke Park’s imminent big game, I stop off at Sarsfields GAA club in Newbridge, County Kildare where I meet with husband and wife team, Cormac O’Donnchú and Georgina Caraher of Dublin-based company Experience Gaelic Games. 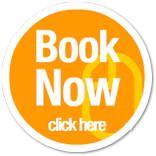 They usually operate out of the capital, which is ideal for a sporty weekend break, but they'll also travel around to local GAA clubs to host events for everyone from stag and hen parties through to corporate away-days and team-building sessions. Having already received training in hurling from a legend of the sport, Cormac and Georgina talk me through the history and rules of Gaelic football before we go outside for some practice and a quick game. I’ve previously been assured that hurling is safer than Gaelic football because you can use the hurley to defend yourself during collisions. One man’s defensive stick is another man’s bat to the head in my opinion, but I soon learn – as I clatter to the floor for the third time in nearly as few minutes – that Gaelic football is quite a physical sport and a well-timed shoulder charge is all part of the game. My trip culminates with a visit to Croke Park, Dublin’s huge 82,000-seat stadium – the fourth-largest in Europe – which is home to the GAA’s various sporting events. It’s an incredible privilege to be here today to see a game of such magnitude that even an IRA terror suspect has had his bail conditions 'adjusted' to allow him to attend! The atmosphere is certainly explosive, the crowd practically drowning out the marching brass band that leads Clare and Cork, this year’s finalists, around a lap of the pitch. 'The world’s fastest field sport' has become something of a tagline for hurling and it doesn’t fail to live up to its subtitle with points scored from the halfway mark of the pitch and frantic action up and down the field nearly on a par with the pace of the average basketball match. Underdogs Clare, who’ve only won the title four times before compared to Cork’s total of 30 wins, dominate the match throughout, so it’s a testament to how thrilling the game is that they only escape defeat by snatching a draw with the very last ball of the match. And with the final whistle the tension is instantly defused. There will be no extra time; no penalties. The game will be replayed on 28th September and 82,300 fans will once again travel across the country to converge on Croke Park, the ticket sales alone generating another €3m, 87% of which will be ploughed back into the sport at a community level. Now that’s what I call a beautiful game. He was a guest of Tourism Ireland.